It was observed by Turi and Plotkin that structural operational semantics can be studied at the level of universal coalgebra, providing specification formats for well-behaved operations on many different types of systems. 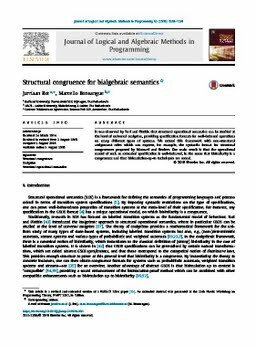 We extend this framework with non-structural assignment rules which can express, for example, the syntactic format for structural congruences proposed by Mousavi and Reniers. Our main result is that the operational model of such an extended specification is well-behaved, in the sense that bisimilarity is a congruence and that bisimulation-up-to techniques are sound.